1D well calibration allows the user to determine a local observed shale compaction trend line (OSCTL) and establish a regional normal compaction trend line (NCTL) which best fits all well sonic and/or resistivity logs. Overburden pressure (OBP) and thus pore pressure prediction (PPP) by either Eaton's or Miller's methods is developed to best match measured or interpreted borehole pressures. This module can be used for real time drilling and completion analyses, or as calibration points for 3D model building. The calculated curves are also available to view in Insight's other 2D and 3D views. Figure 1 shows an example of a 1D pore pressure calibration at a well location. 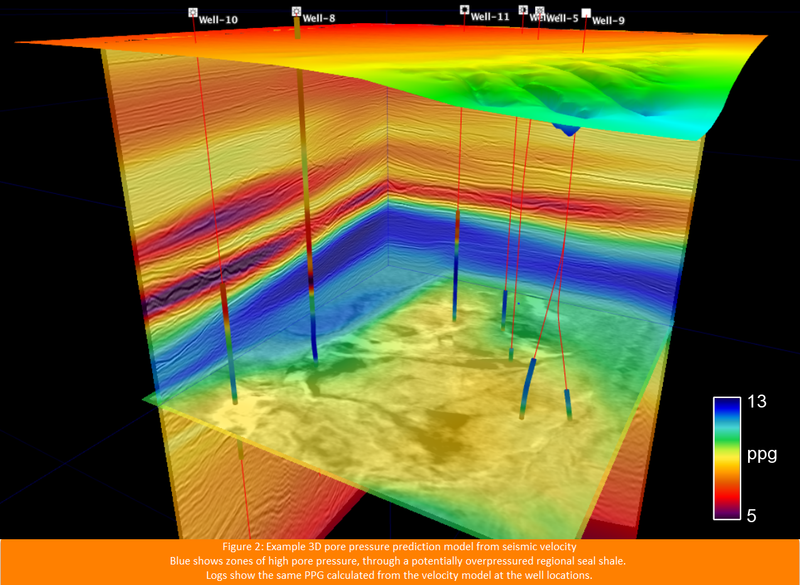 3D model building generates a volume of pore pressure gradient (PPG) from seismic velocity (or resistivity) volumes. This may use the parameters optimised from the 1D well calibration mode, or from other empirical sources. Pore pressure and fracture gradient volumes can then be used for future well planning, to optimise mud weights, and predict hazards. Figure 2 shows an example of a 3D pore pressure calibration from seismic velocity. Below are tables of abbreviations used for methods, symbols or units. 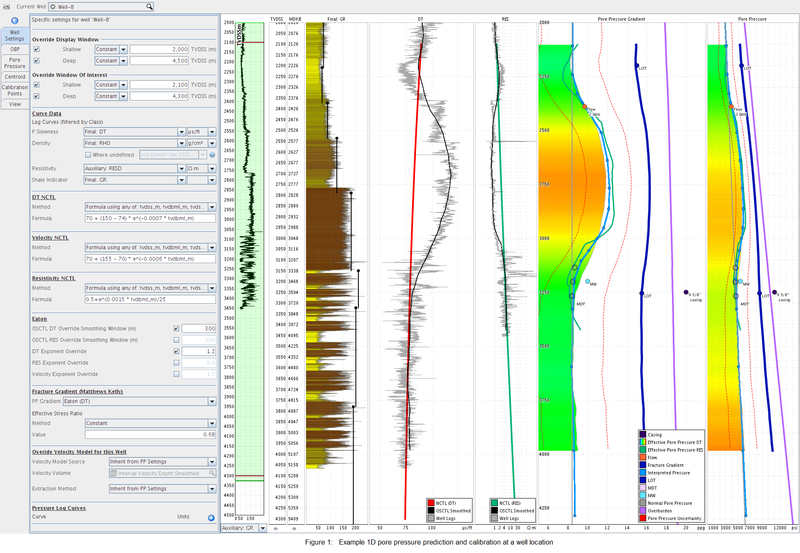 In the various formula builders, Insight provides built-in variables — “tvdss_m”, “tvdbml_m”, “tvdss_ft”, “tvdbml_ft” — for depths measured from the surface or from the mud line, in metres or feet.